Malaysia is not usually a country that comes to mind when one thinks of where the geopolitical initiative lies in the Asia-Pacific. That accolade goes first to China, of course, the rising power in the region, and second to Japan, the state most capable of leading any regional counter-initiative against China. Any regional order that Malaysia pursues that is not aligned with the current geopolitical realities of Japan–China relations will not succeed. 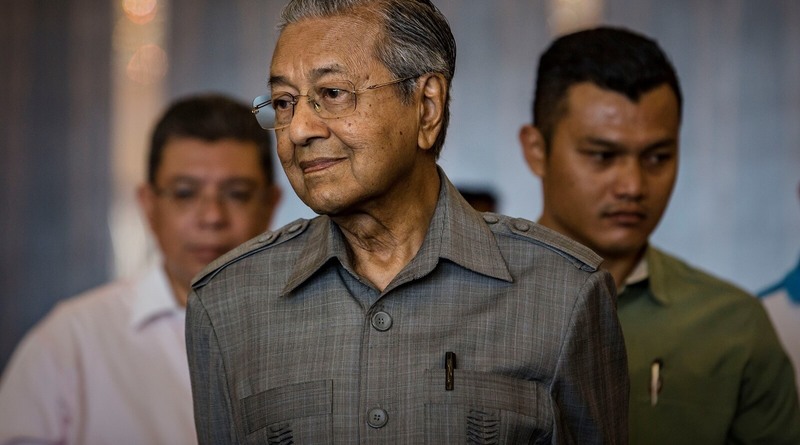 But with Prime Minister Mahathir Mohamad’s surprise return to power in Malaysia in May, it is a good time to re-evaluate the potential and limits of Malaysian geopolitical proactivity. As any Malaysian proposal intended to deal with Chinese pressure will require cooperation with Japan, such a discussion should also pay special attention to the Japan–Malaysia bilateral relationship. More so than even the Association of Southeast Asian Nations (ASEAN), Japan will be the fulcrum of Malaysia’s foreign policy vis-à-vis China. During Mahathir’s first stint as prime minister (1981–2003), he orchestrated the “Look East” policy, bolstering economic ties with Japan and designating that country as a model for economic development. Later, he also promoted the East Asian Economic Caucus (EAEC), essentially a free trade agreement between China, Japan, South Korea, and ASEAN member states, meant to better integrate Northeast Asia and Southeast Asia, which ultimately failed. Malaysia was generally seen as softer on China under former prime minister Najib Razak, and much ado has been made about how Mahathir’s return to power means Malaysia will shift away from China and towards Japan. For example, during Mahathir’s trip to Japan in mid-June, his first foreign trip after the election, he pledged to strengthen ties with Japan, made a pitch for more Japanese investment in Malaysia, and conveyed his determination to reduce Malaysia’s indebtedness to China. Against this backdrop, how can Japan–Malaysia cooperation shape the Asia-Pacific as Mahathir inaugurates his second premiership? International relations scholars often speak of “images” or “levels of analysis”. As with most complex phenomena, each image has something to offer in answering this question. At the “first level” of individual leadership, focusing on Mahathir’s brand of nationalism is useful as an explanatory variable. At the “second level” of domestic politics, analysis should hone in on the legitimacy benefits of cooperation with China versus cooperation with Japan. And at the “third level” of the international structure, the US’s role, especially as mediated through the US–Japan relationship, simply cannot be ignored. Khoo Boo Teik, in Paradoxes of Maharthirism, traces Mahathir’s maturation from a Malay nationalist to a Malaysian nationalist and then to a self-appointed spokesperson for the Third World. Mahathir’s anti-Western nationalism indelibly shaped Malaysia’s relationship with Japan: his “Look East” policy, a cornerstone of Japan–Malaysia relations, originated from this antagonism towards the West, after all. His anti-Western orientation has had more concrete consequences as well: the EAEC failed because Japan refused to take leadership in the regional organisation. While Mahathir conceived of the EAEC in reaction to the US’s inclusion in the Asia-Pacific Economic Cooperation (APEC), created in 1989, Japan was under pressure from the US to not lead the EAEC because of this very exclusion of the US. Malaysian attempts to draw Japan into leadership of a new regional order will not succeed so long as it is insensitive to Japan’s position in the US–Japan relationship; this insensitivity to Japan’s position, in turn, has historically been shaped by Mahathir’s personal proclivities. How much has Mahathir changed in his orientation towards the West in the last 15 years? Observing the rise of China, would he be more open to cooperation with the West à la the US today than he was in the 1980s and 1990s? If he has shifted, then collaboration with Japan to build a regional order will likely be more fruitful. In terms of domestic politics, regime legitimation strategies will come into play. What will Mahathir base his legitimacy on? If it is economic growth pure and simple, then cooperation with Japan will be weighed against cooperation with China on purely economic terms. If Mahathir decides to base his legitimacy on being anti-corruption, and if the Malaysian public associates corruption with China, then the balance will tilt in favour of greater cooperation with Japan; likewise, if Mahathir decides to base his legitimacy on being a reformer and pushes ahead with the Trans-Pacific Partnership (TPP). Given recent trends and the backlash against Chinese investments, Japan appears to be the favoured partner for any regional ambitions Mahathir might have. Does Mahathir still have regional ambitions? During his most recent visit to Japan, Mahathir revived the concept of the EAEC after it had been dormant for 21 years, with membership further expanded to include India and other countries in Central Asia. Interestingly, the two structural variables that doomed that EAEC in 1997 have changed in opposing directions. On the one hand, Japan–China competition has intensified. From this perspective, the EAEC had a better chance of success in 1997 than it does today, as without the buy-in of both Japan and China the concept is sterile. On the other hand, the US’s protectionist turn has forced Japan into a position where it has to be more independent. Because Japan’s hesitation in 1997 was due to US pressure, the prospects of Japanese co-leadership of any Malaysia-initiated, Asia-specific order have increased. Two caveats to this observation are in order. First, we do not know how long the US’s inward turn will last. Trump’s Asia policy is an aberration in the post-war history of US grand strategy, and the future may be too uncertain for Japan to make any bets about the direction and pace of US disengagement. Second, Japan has greater freedom of movement, but this is mostly in the economic sphere. In the military sphere, Japan will strive strenuously to keep the US military engaged in the defence of Japan. Taken in sum, even in the face of US retrenchment, which increases Japan’s freedom of manoeuvre in the economic sphere and lessens the negative impact of any anti-Western sentiment that Mahathir may still retain, any regional order that Malaysia pursues that is not aligned with the current geopolitical realities of Japan–China relations will not succeed. The greatest constraint on Mahathir’s dream of an Asia-only regional order is the very rivalry that defines the regional system today.